Bodrum is a district and a port city in Mugla Province, in the southwestern Aegean Region of Turkey. 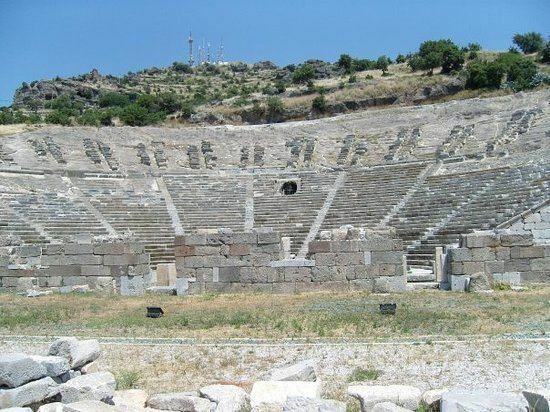 It is located on the southern coast of Bodrum Peninsula, at a point that checks the entry into the Gulf of Gokova, and is also the center of the eponymous district. The city was called Halicarnassus of Caria in ancient times and was famous for housing the Mausoleum of Mausolus, one of the Seven Wonders of the Ancient World. Bodrum Castle, built by the Knights Hospitaller in the 15th century, overlooks the harbour and the marina. The castle grounds include a Museum of Underwater Archaeology and hosts several cultural festivals throughout the year. The city had a population of 36,317 in 2012. 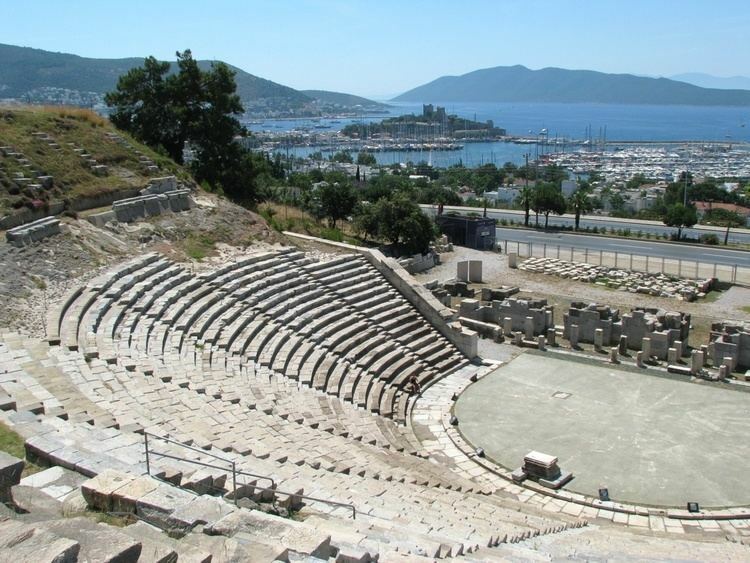 Halicarnassus (Ancient Greek: Halikarnassos or Alikarnassos; Turkish: ) was an ancient Greek city at the site of modern Bodrum in Turkey. Halicarnassus were founded by Dorian Greeks, and the figures on its coins, such as the head of Medusa, Athena or Poseidon, or the trident, support the statement that the mother cities were Troezen and Argos. The inhabitants appear to have accepted Anthes, a son of Poseidon, as their legendary founder, as mentioned by Strabo, and were proud of the title of Antheadae. The Carian name for Halicarnassus has been tentatively identified with Alos?karnos? in inscriptions. At an early period Halicarnassus was a member of the Doric Hexapolis, which included Kos, Cnidus, Lindos, Kameiros and Ialysus; but it was expelled from the league when one of its citizens, Agasicles, took home the prize tripod which he had won in the Triopian games, instead of dedicating it according to custom to the Triopian Apollo. In the early 5th century Halicarnassus was under the sway of Artemisia I of Caria (also known as Artemesia of Halicarnassus ), who made herself famous as a naval commander at the battle of Salamis. Of Pisindalis, her son and successor, little is known; but Lygdamis, who next attained power, is notorious for having put to death the poet Panyasis and causing Herodotus, possibly the best known Halicarnassian, to leave his native city (c. 457 BC). The city later fell under Persian rule. Under the Persians, it was the capital city of the satrapy of Caria, the region that had since long constituted its hinterland and of which it was the principal port. Its strategic location ensured that the city enjoyed considerable autonomy. Archaeological evidence from the period such as the recently discovered Salmakis (Kaplankalesi) Inscription, now in Bodrum Museum of Underwater Archaeology, attest to the particular pride its inhabitants had developed. Alexander the Great laid siege to the city after his arrival in Carian lands and, together with his ally, the queen Ada of Caria, captured it after fighting in 334 BCE. The districts major economic activity centers around tourism.